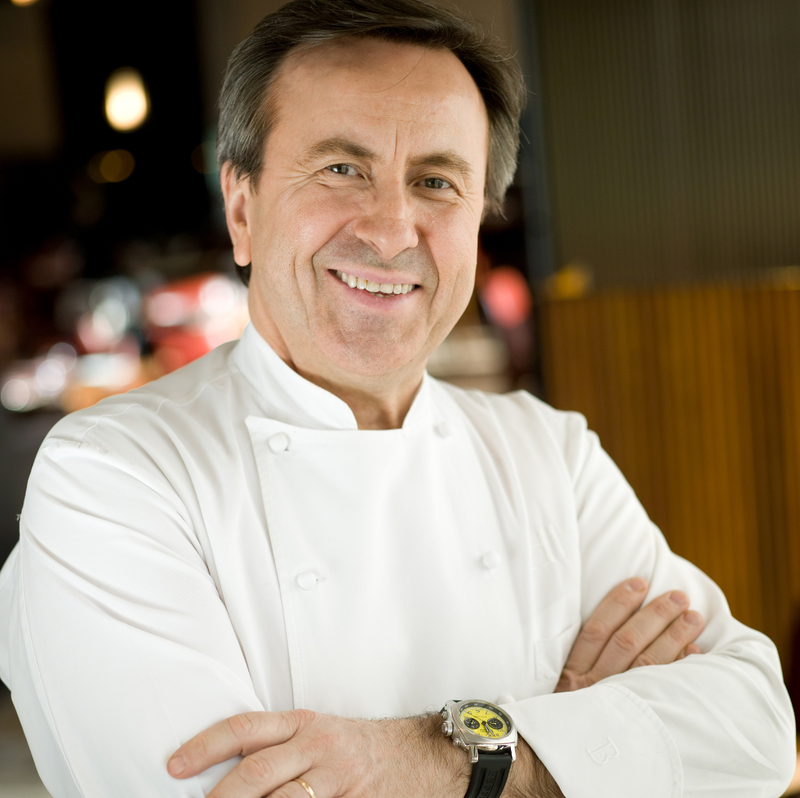 For this weeks Spot the Watch we are featuring Michelin starred French chef Daniel Boulud. The first chef we featured was Eric Ripert, who has a love of Vacheron Constantin timepieces. Mr Boulud has watches from a few brands that are quite recognizable. 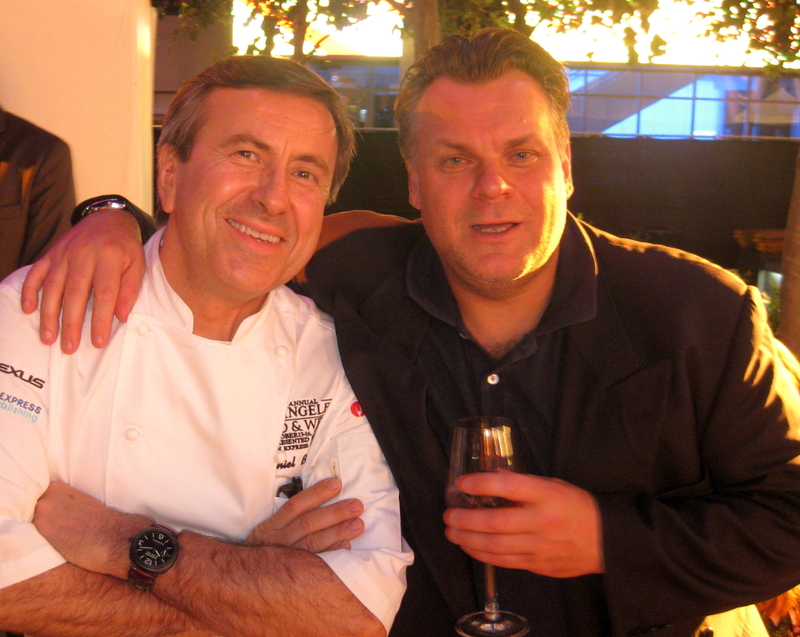 We first used this photo in the Eric Ripert feature because it showed the two chefs wearing noticeable timepieces. 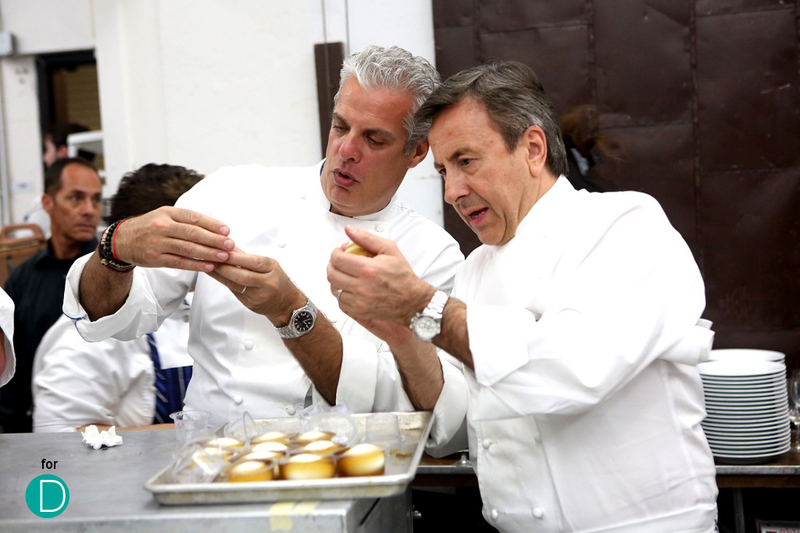 In the photo Chefs Ripert and Boulud look to be checking out the results of some food they have whipped up. On the wrist of Daniel Boulud is the Rolex Daytona. The iconic chronograph in stainless steel. Now we weren’t sure if Daytona in question was housing the 4130 in-house caliber or the 4030 modified Zenith El Primero movement. So we did a little digging and found a picture which gives the answer. It certainly looks like 4030 caliber due to the dark sub dials of the chronograph and brushed stainless steel bracelet. 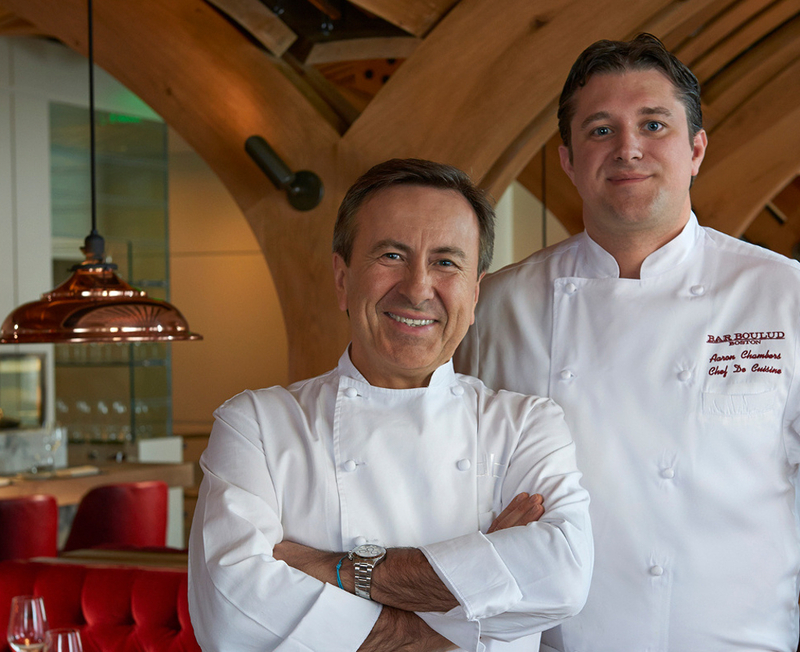 The next brand spotted on the wrist of Monsieur Boulud is Officine Panerai. The first model spotted was made by Panerai but marketed as a watch by Ferrari. Panerai used to be the official partner of Ferrari for making timepieces before both parties went their separate ways. 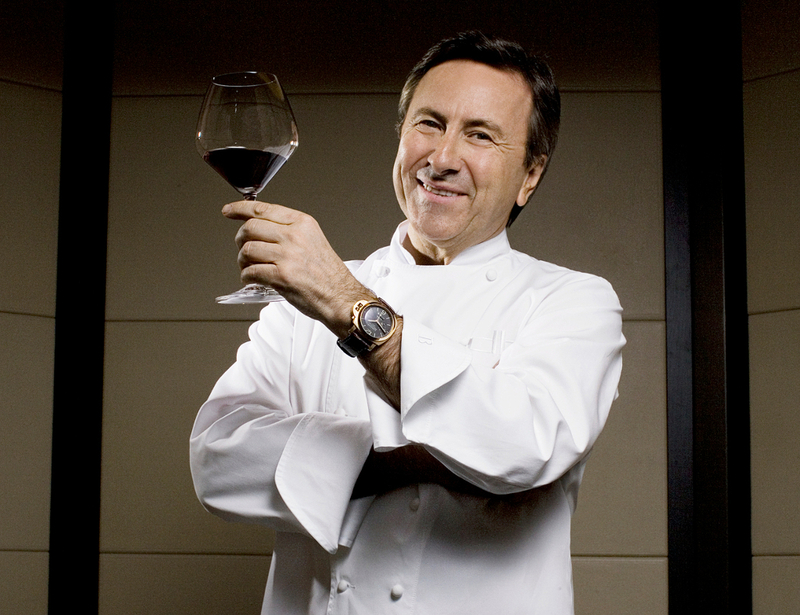 Chef Boulud is wearing the Panerai Ferrari Granturismo Chronograph with a bright yellow dial. These are seldom seen since they were not all that popular. The next model is a Panerai PAM 292 Radiomir in black ceramic. Other famous owners of this model are Brad Pitt, Bill Clinton and Usher. Daniel Bouluds 292 is special because it is a J series. The J series featured the “Pig” 2 man submarine above the word Panerai. After this series the submarine was removed from the dial. The final Panerai spotted on his wrist is the PAM 289 Luminor GMT in Rose Gold. This watch has features the manually wound P.2002 movement with 8 days power reserve. This was the first movement by Panerai to be made in-house. The hefty rose gold 1950’s case makes a statement on the wrist and is capped off by the iconic crown guard. The final watch featured is a Cartier. More specifically the Santos 100 Carbon with rose gold bezel. The case has a ADLC coating giving the watch a matte look with increased scratch resistance. A blend of modern materials combined with an evergreen and iconic watch shape. A famous watch on the wrist of celebrated French chef. We hope you have enjoyed the haute cuisine infused Spot the Watch this week!